We love hearing from people who have experienced the benefits of Earthing! Many customers have taken the time to submit earthing reviews and share their testimonials with us. For that we are very grateful. We hope that you find these earthing stories helpful and inspirational! You have to love a company like this one! Since we started putting rubber soles on our feet we have become less and less connected to the earth which has all the healing power we need! Far more that any expensive antioxidants you can buy for your favourite smoothie and it’s so easy! I love the sleeping mats because you know your connected for at minimum the hours you sleep. You wake up feeling amazing and rested, aches and pains disappeared. Folks this is the real deal, we are lucky a company has taken the interest to provide this to people as we have such a need now more than ever! This is a no brainer in my opinion and one of the best investments you can make in your health. I have had Angie helping me in the Canadian office and she’s been amazing to deal with. I can’t say enough good things. Thank you earthing!!! As a life-long severe asthmatic, now 6 months into earthing, it has nearly completely cured me of this disease. I can now breath better than I have in my entire life, well, since I can remember anyway. I used to use my inhaler 3-4 times a day (during a relatively lightly symptomatic time of year) and much more than that (plus antihistamines & ephedrine) during spring and fall when it would get really bad. Now I use my inhaler maybe once or twice a week, barely even needing it when I do, and some weeks not at all. This spring I barely had any issues at all and I didn’t even think to go on my usual regiment of reactine and ephedrine just to get through it. I was even out bike riding 4 times a week – no issues. Nothing I’ve tried (which has been a lot, like chinese medicine, homeopathy, herbs, spinal network analysis) has had such a substantial curative effect on my asthma. There are many other benefits I got from earthing with the sheet as well, too numerous to list, and I don’t want to retract from the point of my post here: this has nearly completely cured me of life-long moderate to severe asthma.. 95% improvement without a doubt, and I still seem to be improving. Will there eventually come a day when I won’t use my inhaler anymore, ever? That is quite likely I believe, however, I’ve come so far with this that, way beyond my expectations in fact, that anything more at this point is a bonus. To anyone reading this, with asthma, or with children with asthma: don’t take my word on this, please try it for yourself and prove it to yourself. You’ll be glad you did, that I’m sure of. To all those who create and sell earthing products, and to all the researchers who have made it so popular, and of course the man who discovered it: much love, respect, and giant hugs to all of you. Thank you thank you. Namaste and best wishes. Although I do not have pets of my own, when I visit family and friends, their pets enjoy my earthing mat as much as I do! Amazing results…great product for anyone..young or old who has foot / pain issues..
My friend had bunion surgery last year and subsequently had an infection which interfered with proper healing. He was in pain at all times and had to give up his regular walks which made him feel very old (59 yrs). I gave him an earthing sheet, told him to try it. A few weeks go by and he says he can now get out of bed without holding onto the dresser because morning stiffness and pain was so bad. He also has plans to go walking again starting today. I am SO HAPPY for him. And by the way, I am a dedicated grounder, my BP came down (15 pts on the diastolic–bottom number) and my husband says he hasn’t slept thru the night for 10 years until now. AMAZING. I slept my first night on my queen earthing fitted sheet and wow oh wow the results are amazing! I usually sleep pretty good but this sheet helped me relax so well and as I laid there I could feel my body getting so nice and warm, my husband whose feet are always so cold, fell asleep so quickly on it and when his feet touched me they were so warm! I know it had an affect for just one night of use! I feel wonderful even with getting up twice to nurse my baby I Slept so deeply and awoke at 8 with the same vitality and energy I remember having as a teenager.I also have been trying to get over a cold/flu bug for the past week and just one night on the sheet I feel so much better, Wow, I am so happy and impressed! Thanks Clint and earthing Canada for all you do!!! I can hardly believe it! I have slept on my earthing sheet the last 3 nights. After the very first night I did not feel the usual aches and pains with my morning stretch that I attributed to “getting old” (I’m 48 years young!). Every morning I make it a habit of breathing in deep, anticipating pain as my rib cage expands. None! no more. After the very first night and every night after that. I’m sleeping better- wake up refreshed by 6 am rather than the usual 8am “ugh I don’t want to get up”. In the evening I can hardly wait to get to bed and can actually feel it working. I feel tingly all over. It feels very relaxing. By morning the tingling is gone. I have no idea when that stops. I almost feel like a battery discharging lol. Loving it. Thank you Earthing Canada!! A year ago….within a month i lost my Dad ( he was also my business partner), my only sibling was diagnosed with throat cancer, my best friend died and all that put me into menopause!!!! !….I decided to put all of my belongings into storage and move to Salt Spring Island where my family and I had vacationed for 30 years. When I got there I stared to hike the mountains every day, take beach walks for hours every day, eat completely organically and swim naked in the ocean!…(everyone does it there)….I intended just to stay a few weeks and then a few months and that turned into a year. I grieved, I did yoga, meditated and just completely connected with Nature. Growing up on a biodynamic farm in Belgium, my childhood was pure bliss and I felt my soul connecting back to nature in a way I had forgotten, living in the city. The ironic thing was when I would come back to visit my daughters in the city, they marvelled at how I “glowed” with health and vitality and they just couldn’t believe how healthy I had become in such a short time. When it was time to go back to the city I had opened myself up to the possibility to returning to school and study Holistic Nutrition (Im one year through a two year program now. Having a Degree in EthnoBotany and Plant Science, I knew the connection on an intellectual level but I was living proof that “Earthing” is not only a science but a proven phenomenon. Earthing has changed my life! I had chronic neck and upper back inflammation and pain – using the Earthing products while sleeping and at the computer, and also spending time outside ‘connecting’ with the earth through barefoot walking – my inflammation and pain problem has been almost completely solved! I feel at lease 90% better than I did before earthing. Reading the Earthing Book made all the scientific part clear and helped me understand how it all worked. I would highly recommend that everyone learn to ‘Earth’! After my daughter told me about Earthing, I ordered my sheet and experienced such relief and improved sleep, that I have referred these to 2 friends who have shared their experience with several others. In fact, we have given these products as gifts with extreme gratitude from the receivers. We love earthing. It has helped a lot of people in my family. We sleep fantastically well. Minor aches and pains have disappeared. My husband’s high blood pressure has come down and I believe it is due to earthing as much as possible. We take our sheet with us on vacations so we sleep very well everywhere we go. Our son has hypo thyroidism and it seems to be much less intense and the doctor has put him on less medication. Our 91 year old mother loves it – she sleeps well and has healed from hip replacement surgery very well. I have ordered them for friends and they are doing well with earthing too. One has arthritis and he swears it has gotten better since earthing too. Wonderful healing from Earthing. Thank you to all. I have now had my king-sized fitted earthing sheet for two weeks and am loving it. First of all tho’, I would like to add a note – don’t walk around barefoot all day long and then try to sleep on the sheet that same night!!! I had sooooooo much energy and simply could not go to sleep. I might have slept 3 hours the first night but then slept 7 hours straight through the 2nd night. I contacted John to ask about this and he assured me, I am not the first this has happened to. I have stopped taking one of my supplements that I was using for pain and am just fine. I do go back to sleep much easier when I awake during the night for a bathroom break. I also want to comment on the GREAT service you folks provide – not only with delivery of the product but with answering emails promptly. It is also wonderful dealing with a Canadian company. Here’s wishing everyone could own an earthing product. I have more on my list that I want to purchase. Many thanks! I got interested in Earthing through my son. My grandson is autistic and my granddaughter has cerebral palsy. I myself had many health problems such as polymyalgia , high blood pressure, restless leg syndrome, sleep apnea and was overweight. He started out by taking his children to the park and letting them run around barefoot and began to see that his autistic son was connecting better with people. So we decided to go a step further and purchased Earthing sheets for both children and myself. I was in the process of losing a total of 80 pounds and I am sure some of that weight loss contributed to my better health issues but I slept better and the restless leg problem alleviated. I still only sleep no more than 5 hours a night but the quality of my sleep is better and I feel more rested. I put an Earthing pad in my porch by my chair and put my feet on it every chance I get. I always sleep with my sheet except when I am not at home and when I do return something is just drawing me back to my bed. I go barefoot much more than I used to and it just gives you a sense of well being and connection with yourself. I used to take 4 blood pressure medications a day and for the last 2 years have taken nothing. The inflammation in my body has almost totally disappeared and I no longer take shots in my back. Yes the weight loss has helped but I personally feel Earthing has been a contributing factor. My Earthing experience has been nothing but a good one. I have pain in the knee for the last 4 months. I went to 5-6 doctors many times during these months and all their prescriptions/remedies failed. Then I stumbled upon the earthing product and after using it for 2 weeks it is totally healed. Thank you for that!!! Having started out with the mat last fall, I took it everywhere with me, including the VIA train from Melville, SK to Edmonton, AB. Well, you know how hard it is to sleep in a seat on the train….I slipped the mat under my shirt onto my back and slept like a rock! Used it throughout my visit and couldn’t believe how well rested I felt! As soon as I got home I ordered the half sheet! The tingling in my right shoulder and numbness in my right hand due to the rotator cuff surgery I had undergone a decade earlier disappeared!! I had pretty much committed myself to enduring this nuisance for the rest of my life on waking up each morning, now history. I wish I had gotten on to the earthing benefits during the 15 years of shift work I had prior to the surgery. I remember how tired I felt ALL the time! THIS would have been fantastic! Thank you for the excellent line of products. You made a true believer out of me! Hello, from a very satisfied user of your product. We use the sheet on our bed religiously. Thank you for the relief in my lower back due to inflammation. I can now play hopscotch, jump on the trampoline, run more easily with my granddaughters, even though I a 63 years young. My varicose veins are not painful anymore and the restless leg syndrome is just about non existent. Furthermore I was a bit skeptical about using the rod in the ground at camp. Well, I was amazed with the product, one more time, when the light lit up, when I tested it. Again, it is used every time we go to camp, even if it is just for a weekend. My improved sleep and my husband’s cessation of snoring was exciting enough, but the best thing that happened from sleeping grounded was that my husband’s apnea has been cured. We had tried a number of things, unsuccessfully, for his severe apnea, and I worried that it could be very harmful, even fatal in some cases. After a number of months of sleeping grounded I noticed that his apnea was much reduced. It continued to subside and now, more than a year after sleeping on the sheet, the apnea seems to be gone! This was totally unexpected. We had a chance to test these improvements out. Although we always travel with our earthing sheet (even on a cruise ship) we were recently in Ukraine, staying with people whose Soviet-era apartment wasn’t grounded. My husband’s severe snoring came back with a vengeance and kept me awake the whole time. We never go anywhere without our grounding sheet. Thank you, Clint Ober! They give me energy and keep me going! Worked immediately! The night I picked up my Earthing package at the post office was one of the worst snow storms of the season. Driving home from work my shoulders were up in my ears from the tension. Cars were in the ditch. Little visibility. White knuckles from clenching the steering wheel all the way home. Once I got home, I had to shovel so that I could get into my lane way and into my house. I couldn’t have been more tense afterwards. After dinner I was already feeling the lingering effects of the drive and shoveling in my body. The next morning my shoulders and upper back ached. I don’t like taking medication, but seriously considered it that morning. I drove into work and set up my earthing mat on my desk. Within an hour or two all the pain in my shoulders and back were gone. In the past that pain would have been there for days and a trip to the RMT would have been necessary. It was so easy and so fast. I’ve used my earthing products everyday since. I feel great. And, if I ever feel “off” I earth right away. Earthing is part of my life forever. Since I’ve started taking the time each day to walk barefoot on the ground I’ve had more energy and have been sleeping more soundly. MY STORY starts when my brother got an earthing sheet for Dad. His reasons were the touted sleep benefits and circulation improvement. Since I was having sleep problems such as waking up, worrying, and asthma, nights were spent awake, I don’t like taking pills, I thought, why not try It.! The night the sheet was delivered I installed it across the bottom of my bed so my feet could be in contact. This meant I had to go to bed without socks, a practice that had started because of cold feet at night. I was worried about my feet and legs cramping without them. I went to bed at my usual time. I could feel a tingling sensation starting at my feet and going up my legs. Luckily I had no work for two days. I woke up groggy, but, I had slept the whole night. The condition lasted that day, and after the second night it was the same. I was ready to take the sheet off; I had to work the next day. But I decided to continue. Three nights sleep in a row!! I was starting to feel refreshed. By the end of the first week, I realized two things had taken place other than a good night’s sleep, 1, with no socks on, my feet and legs had not cramped, they were warm. 2, I had not used my asthma inhaler at night. After a month sleeping on the sheet I woke up in the middle of the night to the sound of me breathing deeply, it felt so good, and I was so relaxed that I went back to sleep immediately . Imagine an asthmatic being able to breathe while lying down. Then, I understood the grogginess and warm feet, and no need of medication, it was OXYGEN. Just like going to the country, where fresh air makes you sleepy. It made sense, grogginess, warm feet and no cramping; OXYGEN was flowing through me, because I was relaxed and breathing. As I slept well, my dreams came back. Astonishingly, some have been stories. They have a beginning, middle and end, dreamt throughout the night. Some have been so wonderful I wish I had written them down. Months later, other improvements I see. 1. The varicose veins on the back of my hands and the top of my feet had reduced considerably; in the morning they used to bulge. 2. One finger nail grows undulating from an accident years ago, is now growing flatter all the time. 3. My hair always falling out en mass, now, so very few hairs fall. It’s been over a year of earthing. I’ve had several nights of restless sleep , maybe five or six, and a few times a vague feeling of a cramping foot, (by placing my foot flat on the sheet the feeling goes away), and the puffer stays in the drawer over night. I would say it has been an excellent experience. I sleep. I feel good. Since I have begun my Earthing journey, I have had great improvements to my mental and physical health. Prior to Earthing, I often felt stressed out and unrested. I am feeling much calmer now, with less anxiety and more energy. The previous physical feelings of back pain, have all but disappeared. The problems that I was having digesting food are almost completely gone as well. I would recommend Earthing to anyone who is looking for a more positive and happier life. Earthing has wonderful results and is worth a try. I began using a half Earthing sheet in December 2012. I fit in the highly sensitive category so I started with twenty minute sessions.Too much made my body hum in an overwhelming kind of way. I have been recovering from Chronic Fatigue Syndrome, Fibromyalgia, and Candida. In deciding how to proceed with the Earthing sheet, I found the most informative information on Lyme web sites. I used the sheet for twenty minutes a day to start with. I felt very tired and yet more peaceful. I developed a bladder infection which I controlled with natural methods. I recognized from past experience that this was candida in my body running for the exits because something was making my body an uncomfortable place for it to survive. I stopped using the sheet for three weeks to get through the Christmas season. During that time the bladder infection disappeared. When I started using the sheet again, the bladder infection reappeared, and continued for the next three months when it declined, and finally disappeared. I built up my time on the Earthing sheet by fifteen minute sessions every week, to start with, then by half hour sessions. It was a haphazardness process. Even though it is possible to wake oneself at night simply by setting an intent, it is not always an exact science. Once I reached six-seven hours on the sheet, I was able to go eight or more hours straight. To be totally honest I was extremely tired through the process, yet persevered because I felt much better than if I were not using the sheet. It was a labor of patience that took four months. 1) It helps me to slip into a calm, parasympathetic nervous system state, improving my sleep depth and length. 2) It chased candida from my body. 3) I had been taking aspirin daily for several years as it was the only thing I tolerated to control head and body aches. After three months on the sheet, I was able to stop the aspirin other than maybe for severe headaches about two days a month. I attribute this largely to the earthing ability to thin blood to a normal level, and the anti-inflammatory effect. 4) I was able to give up the anti-inflammatory cream that I had been using for tendonitis. I have continued on to other treatments to continue to heal. While all my pains have not been relieved I feel much better, and am healing at a faster rate. I am able to tolerate healing methods that I could not before using the Earthing sheet. I was suffering from peri-menopausal hot flashes, especially at night. Would wake up up to a dozen times a night soaked. I was taking some herbal supplements for these hot flashes and they worked well, only waking up 2 to 3 times a night but after I started using the earthing sheet from Earthing Canada I noticed that I was no longer waking up at night, no hot flashes anymore. AT ALL! I stopped taking the herbal supplements and the results were the same. I did not know that the earthing sheet would help with menopause but it certainly is for me and I am very grateful for it! I have been telling my friends about this. Thanks Earthing Canada! I started to read the book Earthing a few months ago and right at that moment, my life changed completely. I was astonished to learn how powerful this simple but vital connection with the Earth was!! It was still winter when I read the book and I couldn’t go yet walk bare foot in the grass so I decided to try the Earthing kit. I was so excited about this that I was giving the information to every person I encountered even if I didn’t try it yet. Up to this day, I continue giving the information about Earthing and now, I also have my own personal experience to share. I have noticed a subtle but consistent change in my life starting with my sleeping habits. I realized after a while that I would wake up on the morning rested, full of energy and almost no sore sensations in my body. My menstruation also became less painful and more regular. My back pain decreased and any time I start to feel the pain again because I did too much, I go rest on my Earthing sheet and get better. Summer is now blooming and whenever I can, I go outside and touch happily the earth with my hands and feet. Not only my health comes back to balance but the book Earthing also enriched my connection with the Earth on a deeper level. I become more in touch with myself, my body, the earth and what affects my health. I enjoy being in nature and walk bare foot but I know that I have a good back up for the time I spend sleeping and for the cold season! That way, I know I can enjoy the benefits of Earthing all year long. For all of this I am grateful and I know that I will continue to share those precious informations with people around me. 2ndly, I have been using a sheet (all folded up) on my brother (59 yr old) who has residual effects (anoxic brain injury) from near-drowning & stroke in cold canadian lake two years ago. I have been placing the mat on his legs at night for about 3 months. He is calmer, sleeps better and his speech has become more complex (even tho it is still hard to understand at times.) His severe contractures seem to be lightening up too. I didn’t see much in the book on “stroke” but I feel that the positive adjustment of hormone levels is a good thing for him. He has ALL his faculties except movement, so of course we hope somehow continuing use of the mat will effect his brain in positive manner and that we will continue to have improvements. Since separating from a 37-year relationship last December, I have been wracked with grief, guilt, and anxiety. Getting used to living on my own has been extremely difficult. The silver lining is that I live two blocks away from a beautiful park. Now that the weather is warm, I walk to the park almost every day, kick off my sandals, work my soles and toes into the green grass, and breathe. Sitting there for a while, I begin to feel calmer and more grounded, not so sad. Earthing is helping me to be strong. I got interested in Earthing because of the difference in the way my vacations left me feeling. If I went skiing or hiking I felt okay, but not really rested in any way. If I went to a beach or somewhere that my shoes were off for a great deal of time and I was directly in contact with the soil/ sand/ dirt/ grass, well, I felt better. I felt rested. I felt calmer. I felt less stress. I just felt better. Once I realized that the difference was the connection with the earth I understood what was happening. I am not living near a beach but I do have lots of contact with grass and trees and go barefoot a lot more now. The feeling was close to instant for a feeling of okay-ness. I wanted more. I decided to buy an Earthing sheet just to see if there was a real noticeable difference. Yes there was,,,,,,,,, you can actually feel it the first night. I am in love with this product. I and my husband sleep now. We awaken refreshed. Trees…they take my breath away. But truly, it is what they have given me that inspires this personal story. Increased energy, pain relief, enhanced mood and a sense of peace…these are only a few things that have resulted from my connection with trees and the earth. Years ago, as a teenager, I was diagnosed with CFS (chronic fatigue syndrome) which back then, was considered untreatable. A few years later, I began suffering from severe depression and was told I would have to take medication for the rest of my life. Not knowing any better, I resigned myself to this fate. A turn of events led me up to Northern Ontario as a tree-planter. I spent many nights asleep under the trees and I woke up without the aches and pains I had gone to sleep with. The previous days stresses had been forgotten and I felt renewed. I came back from tree -planting and slowly forgot how great I had felt among the trees and earth. Years later, I was riddled with chronic pain after a car accident and was diagnosed with fibromyalgia. Again…I was told I would have to live the rest of my life with the pain as there was no cure. I remembered how healthy and alive I had felt up north and began making a conscious effort to connect my body with the earth. ‘Tree hugging’ became a favourite ritual for me…shoes off, arms wrapped around a big oak. This energy transfer inspired me to explore energy healing and I studied Reiki to the master level. By grounding ourselves, we are able to facilitate healing at every level…emotional, physical and spiritual. We all instinctually need a sense of being rooted, feeling strong and steady, energized and alive…and earthing (and tree-hugging!) is the easiest and most gratifying way of accomplishing this. My experience with trees and natural energy have changed every aspect of my life. I have found a career that brings me joy and have overcome CFS, depression and fibromyalgia. My wish is for everyone to discover the natural healing power of the ground beneath our feet…our earth. Love your earthing sheets, make me sleep like a baby! I have used the earthing devises for more than 6 months. It helps a lot to improve the quality of my sleeping. Every morning I feel refreshed. Also it helps me to improve my neck pain. Also I feel so warm when I am using the earthing blanket at night as well as the earthing bed sheets. I have introduced it to my family and they all have the same benefits. It also helps my brother who is living very close to the cable tower. It helps him to sleep better. I will continue to introduce it to my friend who are suffering from poor sleeping pattern and chromic pain. The earthing devices are a great invention to help the people who are living in the urban area. I became extremely fatigued after an intense first year at school, running my own business and household, having my dog become ill over several months and then dying, and after not one but two friends unloading suicidal thoughts and trying to keep their heads above water. When the first day of my second year of school rolled around, I opted out for a year. I knew if I continued on this course, I would not make it. I began my journey over the year, with seeking ways to better my health. I started with the medical doctor and she put me through a series of tests that ruled out a brain tumor or a stroke and heart issues. All was clear. I then took more tests and the results indicated that I had adrenal exhaustion and heavy metal poisoning. I napped often. I could not think clearly. My memory just did not work. I knew something had been really wrong. I set about learning ways to help myself. One of the significant game changers to my recovery was the discovery of “Earthing” from an article and interview of Dr. James Oschman. The idea of healing inflammation and nerves sounded like a possibility on the road to healing. I thought that I would give it a try so I ordered the kit. The first night laying on the bed sheet, I kept feeling a sort of “zinging” feeling in my left side of my brain. Geez, maybe I was having a stroke? Later, I read in the book that indeed was a common occurrence of feeling such a sensation when the body was attempting to heal itself. This sensation continued for weeks. I could not say it was definitely helping but something was happening. Long story made short, a few weeks went by and I could feel my brain getting better as I was thinking clearer. Then months went by and definitely my brain was functioning better as I could retain a thought after going off on a tangent and circling back to the point where I left off. My photographic memory started to work again. I was healing my brain! I continue to use the bed sheet. I did not use the mat since someone would end up borrowing it as I spread the word and I never got to use it. I ordered 2 more mats and each time before I could use it, off it goes for someone else to heal. It has been 2 years since I began using the earthing sheet and still no return of my mats. When something is this good, I should not expect them back! I was first introduced to Earthing by my sister who was using the products to attempt to relieve herself of significant pain as a result of inflammation. I was skeptical and started doing some reading. I read everything i could find including the book. At the same time, i thought i would try it because i was recently diagnosed with adult asthma. So I started earthing at 6am every morning by sitting in a chair on my lawn with my feet in the dewy grass. Then again for one or two hours in the evening while doing my gardening. Whenever i earth before bed i have great sleeps. As for my asthma I don’t see differences because i’m on medications which seem to control it and not understanding what my triggers are, its difficult to know whether earthing is helping. But to my surprise after earthing for about two months as i’ve described, i have lost 13 pounds for what i can only attribute to earthing. The weight just dropped off. I had to Google”weight loss and Earthing” before i actually made the connection and believed it. Over all i’m feeling healthy which is hard to describe but this wasn’t the case a couple of months ago and another reason why i start this. I see benefits and once i get my grounding kit i plan to use it more frequently. I am a believer! Last summer I read the Earthing book on the plane to Europe. When I arrived at my destination I had been awake for 20 hours, and was 10 hours jet-lagged as well. During the afternoon of the following day, I took the opportunity to try this new concept of earthing that I had just been reading about…I walked to the city park, found a quiet spot and lay down face first in the soft grass. I fell asleep for about 30 minutes, and woke up feeling really refreshed. I slept straight through the night that next night and did not have any jet-lag at all. Just to be sure I tried the same thing on my return home three weeks later! I took my shoes off and sat barefoot on the grass for about 45 minutes during the afternoon of the first day back, when I was feeling particularly groggy (it being 4 am for my body). I began to feel much more alert, and stayed awake without difficulty until it was time for bed (local time). Since then my husband and I have used the earthing sheet on our bed, and I have noticed his snoring has really diminished. A friend of mine showed up one day with a book and said YOU HAVE TO READ THIS! It was one of the best things I ever did. I suffered from Fibromyalgia, Narcolepsy & Insomnia, Depression, ADHD, and Allergies to nearly everything. I was 31 at the time, a single mother, with 2 young children and I had a difficult time being a mother and I could not work because my body couldn’t handle it. I’m a very ambitious and motivated person so I felt incredibly crippled and debilitated. I did everything I could to hide my pain and discomfort but could not keep appointments and my children missed some school because of my health issues. I read the book and created my own grounding sheet just like it was described in the book, because I didn’t have much money. It was amazing. I slept for an entire night for the first time in years and my allergies didn’t seem to bother me. I could breathe better. The next night, my daughter was having an asthma attack and I had her lay on the sheet and she was able to get breath faster and her coughing subsided. She was able to sleep without coughing for the first time in months. Since then, I purchased the earthing starter kit and have the half sheet on my bed. I sleep regularly, function like a normal person, and am no longer on any medication. Best of all, I have started my own company and am using my skills to help thousands of others and I’m doing the things I love. I am able to attend everything with my kids and have them to school on time and don’t miss my own appointments. It’s absolutely incredible. An amazing difference because I seriously thought at the rate my health was declining that I wouldn’t live past 35 and now I can’t see myself dying before 70 or later. Thank you for this experience and I highly recommend this to EVERYONE!! My Mom has been Earthing for about one year now. She uses the body bands or the half-sheet every night. I have noticed that she has more energy and gets more things done around the house. Before she was tired all the time and did not get very much done. because i was not sleeping well, a friend lent me her earthing blanket to use for a few nights. nothing happened for the first few nights, but on the fourth night, i slept like a baby. i slept seven hours straight and was quite energetic upon waking. usually i would sleep for a few hours and then wake up. also, i would feel heavy and groggy upon waking. also, i felt less pain on my joints as a result of using the grounding blanket. So, grounding has worked for me. I was in a very serious MVA (motor vehicle accident) fifteen years ago and have had ongoing health issues and chronic injuries since then. I’ve tried everything – nutritional supplements, chiropractic treatments, naturopathic care, physiotherapy, pilates – and they would work for awhile and then the pain and fatigue would return. My naturopathic doctor gave me the Earthing Book to read about a year ago and I decided that I didn’t have anything to lose by trying it. It sounded pretty far out there but I remembered how wonderful it used to feel lying on the grass in the summer when I was a kid. I took a leap of faith and ordered a Starter Kit and also the body bands. Wow!!! I was not prepared for what would happen. Earthing is a powerful detoxifier and I started off by using it too much at first. I had a detox reaction and felt sore and tired for several days until I realized what the Earthing was doing. Instead of just quitting, I cut back on how much time I was Earthing each day by using the smallest body band for about 30 minutes each day, gradually building up my time every week, until I could start wearing it when I was sleeping. I don’t think the average person would have that reaction, but because I had been ill for a very long time, I think that is why my body reacted the way it did. I was diagnosed with Sleep Apnea several years ago and fitted with a CPAP machine. I stopped using it after several months because the noise and the breathing hose would wake me up every time I rolled over. Then I tried Melatonin. That didn’t work either. The first thing I noticed when I began using the small body band all night was how soundly I slept. I had not slept that well in years. I would wake up during the night and then could not get back to sleep. Now I sleep six to eight hours without waking. And dreams – oh my gosh! I have vivid dreams most nights when I am Earthing, which means that I am getting a deep, restful sleep now every night. I have even slept through the alarm clock in the morning a few times, I have been sleeping so soundly. I have had a problem with chronic inflammation, fluid retention, and weight gain since the MVA. It is hard to exercise when you are tired and in constant pain. When I started wearing the body band all night, I noticed that I started to lose weight and fluid. My diet didn’t change; my level of activity didn’t change; the only thing I was doing differently was the Earthing. Over the course of a year I started using the larger size body bands when sleeping, graduated to using two body bands when sleeping, and now sleep with the half-sheet and one body band. I rotate the bands depending on where my pain is localized. One of my knees was injured in the MVA and would cause constant pain when I walked. Walking up and down stairs, or walking any distance, would cause fluid to build up in my knee and it would be huge by the end of the day. In an attempt to avoid having surgery on my knee, I started using the body band on that knee every night. I started waking up in the morning with less pain and no fluid. I was able to walk up and down flights of stairs without holding onto the hand-rail and taking the steps one at a time. My knee is far from healed, but it is much better than it was a year ago. I now have more mobility and less pain every day. Now, when I “plug myself in” for the night, I can feel the Earthing taking effect. I get this tingly feeling throughout my body, which I have come to realize is the Earthing at work. By morning, I am very tingly. Initially, the tingly feeling was a bit overwhelming, but I have gradually become accustomed to it and now quite enjoy the feeling. One night I woke up during the night and wondered what was wrong because I wasn’t sleeping well and I wasn’t feeling tingly. Eventually, I did fall back to sleep. In the morning, I realized, that my Earthing plug had come out of the wall receptacle and I wasn’t “plugged in”. Now, I check that it is plugged in before I get into bed. Going to bed at night has, once again, become an enjoyable experience. I have a restful nights sleep, I have little to no pain when I am Earthing, and I wake refreshed and with more energy. I am getting through every day without a nap and getting much more done than before I started Earthing. Lately, I have noticed that my skin is looking younger and healthier than it used to. Before it looked dry and wrinkled (like a ninety year old person!). Now it is smoother and healthier looking. It has taken fifteen years for my body to deteriorate to the state it reached when I started Earthing. However, I am confident that with continued use of my Earthing products, that my body will continue to heal itself a little bit every night. And the nice thing is that it is healing when I am sleeping and I don’t have to do a thing. Who would have ever thought that something so simple and so easy could be so effective. I am very grateful to my naturopathic doctor for suggesting that I try this. I am also grateful to Clint Ober who discovered this and had the courage of his convictions to pursue his investigation of this Earthing phenomenon and make it available to the world. We really do believe in this EARTHING program. We’ve been doing it for a couple of years and we think it helps everything. 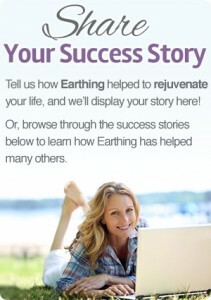 I have found earthing to be a remarkable experience and I have been recommending it to everyone! Within 2 days of sleeping earthed, I was only waking once through the night instead of 5 or 6 times. By two months I had begun dreaming again – something I couldn’t remember doing for years! Recently, I had live blood analysis done, and my blood cells were nice and round and floating freely – just like the photos in the book! There was also evidence of a healing lymph system. Blood pressure is down, too. I have also noticed that I do not have the body aches, lower back in particular, that I did before grounding which is amazing. I am grounded through the night and most of my day at work and cannot even begin to imagine giving it up! Our family of 5 started earthing 4 months ago. We own/operate a dairy/crop farm. Mostly I stay home and help only when needed. My husband and I sleep on the sheet and pillowcase. He was always skeptical so I watched to see the differences in him. He has suffered with restless legs, trouble sleeping, light sleeping, trouble falling asleep and and staying asleep, and when he wakes up it is difficult for him to get back to sleep. No matter how tired he was, it seemed he could only get 4 or 5 hours of sleep total. He also was not a calm person, easily upset, and stessed by everyday problems. Within weeks I watched as all these problems diminished. Before, when he laid down to sleep his restless legs would flare up and he would have to take a pill and wait for it to work before he could sleep. Now, he even admits that he has only felt the restless legs a few times since we started grounding and he didn’t have to take the pill because it just went away quickly after laying on the earthing sheet. This man used to rip holes in the sheets with his toenails because he was so restless. I am glad he is better cuz our sheet is worth a lot more now! He would be so sleepy at 10pm and now he stays up til 11 or later because he doesn’t exhaust so easily. Now he sleeps so deep and I can tell because he makes this deep-sleeping-breathing noise that before would only happen if he was totally exhausted and sleep deprived which forced him into a deeper sleep. Also he would always hear me if I came into bed later than him and now he doesn’t so I know that he is sleeping deeper and not being disturbed by my every movement. It has been amazing how much calmer he is when a problem arraises, which is quite often as we are dairy farmers. He used to vent for days and would end up taking his anger out on me too. I too felt the difference in sleep quality within the first week or so. I had no trouble falling asleep or staying asleep but I would never feel refreshed in the morning, but rather heavy and groggy. I have never been a morning person for this reason, which had been a sore issue between my husband and I since he always has to get up early no matter what to do chores and would’ve liked us to have a similar sleep scheduele. He could never understand how I could sleep for 11 or 12 hours straight every time I had the chance. I enjoy staying up later since I would sleep in longer. I love it in the summer when I don’t have to get the kids up for school and so during the school year I would often sneak back into bed after the kids got on the bus! I always felt that I NEEDED 9 HOURS OF SLEEP per night or I wouldn’t be a pleasant person throughout the day and would feel like taking a nap. Now, what a difference earthing has made! I don’t need 9 hours of sleep, in fact on saturday mornings I am unable to sleep more than 9 hours even if I try and on weekdays I usually get 7 hours each night. It was so weird when I started waking up and felt so alert and alive and didn’t feel like going back to bed. For the first time in my life I could be productive all morning without that sleepy feeling and I could accomplish so much more. I still would go to bed at the same time, or later, since I didn’t feel so exhausted. I know I am sleeping deeper. That is the only explanation! I have had poor circulation for most of my life and would always wear long-sleeve pajamas, socks and 2 blankets in order to warm up enough to sleep comfortably. Having cold feet is the only thing that would bother me enough to make it hard to fall asleep. My husband knew it was just me cuz he would sleep naked with just half of 1 blanket and insist that it was not cold in our room. The first nights I slept on the earthing sheet, I forced myself to remove the socks and pants and within 5 or 10 minutes….i was astonished at how my feet just warmed up from the contact with the sheet! I was able to throw off the extra blanket for good! I am trying the naked sleeping thing, and I don’t feel chilled, but wearing pyjamas is a habit that is hard to break. 1 year before I began earthing, my thyroid began to spiral out of control, low thyroid funtion. I gained weight very quickly. The doctor continued to increase my dosage. After 6 weeks of earthing, the tests showed that I needed to decrease my dosage. I am guessing that it won’t be long before they will decrease it again. Also, during these past 4 months while visiting the doctor often for surgical treatment of my varicose veins, I have watched how my blood pressure has steadily dropped from 120/80 (which isn’t bad at all) to 103/70, my lowest BP level ever!! I can’t wait til the next time hubby gets his BP checked because he was borderline for hypertention, which runs in his family. The way he seems calmer and less explosive, makes me think that it could be lower BP that is affecting him in this way. My 2 older children love to wear the body bands to bed. My 9 year old son has asked me nicely to order the pillow case for him. My 6 year old tends to get too tired sometimes to put them on and it shows when I have to drag her out of bed in the morning. Then the next day she wears them and wakes up saying” I slept really good, mom” and hops out of bed right away. Our baby started earthing on a 1/2 sheet at the age of 9 months and since he doesn’t talk, it is harder to know how he feels different. All i can say it that 1 month after he started earthing he was cutting in 5 new teeth all at once (due to an upgrade in nutritional diet) and he didn’t fuss or lose a wink of sleep that whole time. Having 2 other children, I know this is not “normal”! In fact, if I didn’t see the teeth with mine own eyes, I wouldn’t have even known that he was teething, his behavior did not change. My uncle is suffering from a large cancerous tumor in his colon for a few years now and is treating it with natural foods and supplements. He has had increased pain all day. He saw the doctor and was prescribed pain pills. He tries hard not to take them, but he was getting worse. I sent him the earthing pad for christmas 3 months ago and just last week he was telling me that it makes a day-and-night difference in his pain level. The pain would keep him awake before and now he sleeps so much better. He started taking the pad with him around the house because it felt so much better. Who knows if it is helping him to fight cancer….but at least now he is feeling better while trying, and without having to take a pain-relieving drug. This has improved his quality of life. I am truly thankful to everyone that has made earthing products and information available to everyone to use. I only wish this had been discovered 50 years ago because there has been so much suffering. It is sad that we have all become so disconnected. We truly are healthier now because of it. I will share this information with many friends and relatives. Pictures always make a story better. Feel free to include one.